Comparing two nonlinear microbial models, we found that, in response to warming, soil C decreases in one model but can increase or decrease in the other model, and sensitivity of priming response to carbon input increases with soil T in one model but decreases in the other model Significance: these differences in the responses can be used to discern which model is more realistic, which will improve our understanding of the significance of soil microbial processes in the terrestrial C cycle. The exchange of greenhouse gases between the land and the atmosphere is often measured by monitoring the gas concentrations inside a chamber which is placed on the ground. We investigated different ways to calculate the gas exchange rate and identified several different processes which influence the gas exchange measurement. We studied short-term changes in the microplankton community in the Chukchi Sea with regards to responses to the strong wind event (SWE) during autumn (September 2013). It is assumed that atmospheric turbulences, such as SWE, may supply sufficient nutrients to the surface layer that subsequently enhance the small bloom under the weak stratification. After the bloom, the dominant diatom community then shifts from centric-dominated to one where centric/pennate are more equal in abundance. The plant functional type (PFT) concept is widely used in global vegetation models but recent studies have attempted to replace this with a more biologically representative formulation by using plant traits. In this study we aim to quantify the performance of a data-constrained leaf phenology model that uses PFTs when compared to one that uses local traits. We show that the PFT model performs relatively poorly but we can identify a small number of traits that improve model performance. We explore the estimation of NCP using an oxygen time series from a surface mooring located in the River Thames plume. Our study site is identified as a region of net heterotrophy with strong seasonal variability. Short-term daily variability in oxygen and horizontal advection is demonstrated to make accurate estimates challenging. The effects of bubble-induced supersaturation is shown to have a large influence on cumulative annual estimates. Repeat-survey airborne laser scanning is used to build a simulation model of vegetation carbon dynamics in a Spanish woodland. Analyses of National Forest Inventory and tree-ring data are used to validate the woodland growth estimates. An average carbon sequestration rate of 1.95 Mg C/ha/year over a 100-year period is predicted, but this is highly sensitive to fire frequency. The study contributes to the important need to monitor large-scale carbon dynamics in the age of climate change. Svalbard archipelago has lots of valley glaciers, and its position in organic carbon flux to ocean remains unclear. In this work, we found that these valley glaciers have a much higher area-weighted and discharge-weighted organic carbon flux, relative to Greenland Ice Sheet, and are comparable to other valley glaciers like those in the Alaska region. Hence Svalbard glaciers are an important source for terrestrial carbon. The sea-surface microlayer (SML) is a very thin layer at the interface between the ocean and the atmosphere. Organic compounds in the SML may influence the exchange of gases between seawater and air, as well as primary aerosol emission. Here, we report results from the SOPRAN M91 cruise, a field study to the coastal upwelling regime off Peru's coast in 2012. Our study provides novel insight to the relationship between plankton productivity, wind speed and organic matter accumulation in the SML. Using satellite-derived data sets we have found drastic changes in the timing of the annual cycle in physical and ecological variables of the Baltic Sea over the last 30 years. The summer season starts earlier and extends longer. The period with sea-surface temperature of at least 17 ˚C has doubled; the period with high water turbidity has quadrupled. While both the phytoplankton spring and summer blooms have become earlier, the annual maximum has switched to the summer cyanobacteria bloom. We measured rates of phytoplankton photosynthesis at the level of initial charge separation in PSII and at the level of carbon uptake in iron-limited phytoplankton field assemblages over a diurnal cycle. Our results show significant diurnal uncoupling of the two rates. The uncoupling between rates complicates the derivation of carbon-based estimates of phytoplankton production from rates of charge separation. However, it can be explained as evolutionary adaption to iron limited conditions. We studied the effects of ocean acidification (OA) on the aquatic crustacean Eurytemora affinis and measured offspring production in relation to pH, chlorophyll, algae, fatty acids, and oxidative stress. No effects on offspring production or pH effects via food were found. E. affinis seems robust against OA on a physiological level and did probably not face acute pH stress in the treatments, as the species naturally face large pH fluctuations. This study examines challenges in modeling phytoplankton blooms in Northwestern Arabian Sea and Gulf of Oman. Blooms in the region show strong modulation both by seasons and in the wintertime by eddies. However getting both of these correct is a challenge in a set of state-of-the-art global Earth System models. It is argued that maintaining a sharp pycnocline may be the key for preventing the wintertime bloom from being too strong and for allowing eddies to modulate upward mixing of nutrients. We present the first measurements of N2O across three mesoscale eddies in the eastern tropical South Pacific. Eddie's vertical structure, offshore transport, properties during its formation and near-surface primary production determined the N2O distribution. Substantial depletion of N2O within the core of anticyclonic eddies suggests that although these are transient features, N-loss processes within their centres can lead to an enhanced N2O sink which is not accounted for in marine N2O budgets. Nutrients determine the balance between inputs and outputs to and from the soil and thus exert a strong impact on the total soil organic carbon stock. However, for phosphorus, this impact has not been comprehensively addressed. Here we show in 10 different long-term experiments that phosphorus fertilisation can significantly deplete soil carbon stocks, despite a positive impact on plant growth and thus carbon inputs. Thus, soil carbon decay is most likely stimulated even more strongly. Oxygen isotopic signatures of N2O are formed in complex multistep enzymatic reactions and depend on isotopic fractionation during enzymatic reduction of nitrate to N2O and on the oxygen isotope exchange with soil water. We propose a new method for quantification of oxygen isotope exchange, with simultaneous determination of oxygen isotopic signatures, to decipher the mechanism of oxygen isotopic fractionation. We indicate the differences between fractionation mechanisms by various pathways. Although ranging among the most expensive gourmet foods, it remains unclear whether truffles accumulate radioactivity at a harmful level comparable to other fungi. 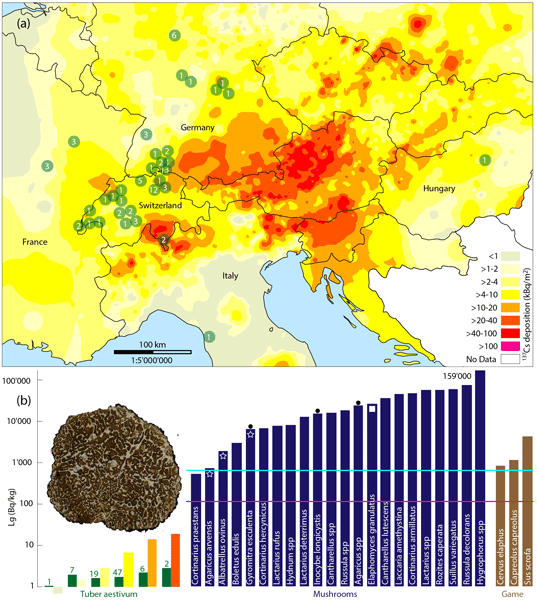 Insignificant radiocaesium concentrations in specimens from Switzerland, Germany, France, Italy, and Hungary provide an all-clear for truffle hunters and cultivators in Europe as well as dealers and customers from around the world. In this study, we combine phytoplankton pigment data with particulate inorganic carbon and chlorophyll measurements from the satellite record to assess recent trends in phytoplankton dynamics in the North Atlantic subtropical gyre, with a focus on coccolithophores. We show that coccolithophores in the North Atlantic have been increasing in abundance. Correlations suggest that they are responding positively to increasing inorganic carbon from anthropogenic inputs in the upper mixed layer. There is increasing interest in measuring methane emissions from tree stems in a wide range of ecosystems. This is commonly done with bulky closed chambers, which limit measurement to a very narrow range of tree stem sizes and shapes. We designed, described and tested new semi-rigid stem-flux chambers with decisive advantages (reduced permeability, fast deployment, adapted headspace volume, easy to carry in multiple sizes, extremely light and economical) ideal for use in remote ecosystems. In stratified shelf seas, physical and biological conditions can lead to seasonal oxygen depletion when consumption exceeds supply. An ocean glider obtained a high-resolution 3-day data set of biochemical and physical properties in the central North Sea. The data revealed very high oxygen consumption rates, far exceeding previously reported rates. A consumption–supply oxygen budget indicates a localized or short-lived resuspension event causing rapid remineralization of benthic organic matter. We present the first analysis of population structure and cohort distribution in a fossil oyster reef. Data are derived from Terrestrial Laser Scanning of a Miocene shell bed covering 459 m². A growth model was calculated, revealing this species as the giant oyster Crassostrea gryphoides was the fastest growing oyster known so far. The shell half-lives range around few years, indicating that oyster reefs were geologically short-lived structures, which were degraded on a decadal scale. We investigated the impacts of climate change and thawing permafrost on vegetation dynamics in Bylot Island, Nunavut. The development of gullies has created new drainage systems within the wetlands, promoting the emergence of mesic plants at the expense of hydrophilic ones within 10 years after disturbance inception. The landscape transformation from wet to mesic plant communities can have substantial consequences on food availability for herbivores and methane emissions of Arctic ecosystems. We showed that the reed canary grass (RCG) was environmentally friendly from the CO2 balance point of view when cultivated on this mineral soil. When compared to the earlier findings on the same crop on organic soil site, the capacity of the crop to withdraw atmospheric CO2 was even stronger on the present mineral soil site than that on the organic soil site. For full estimation of the climatic impacts of this bioenergy system, a life cycle assessment will be needed. We show that the Black Sea oxygen inventory has decreased by 44 % from 1955 to 2015, while oxygen penetration depth decreased from 140 to 90 m. A transient increase of the oxygen inventory during 1985–1995 supported the perception of a stable oxic interface and of a general recovery of the Black Sea after a strong eutrophication phase (1970–1990). Instead, we show that ongoing high oxygen consumption was masked by high ventilation rates, which are now limited by atmospheric warming. In the Amazon forest, wind disturbances can create canopy gaps of many hundreds of hectares. We show that inputs of plant litter associated with large windthrows cause a short-term increase in soil carbon stock. The degree of increase is related to soil clay content and tree mortality intensity. The higher carbon content and potentially higher nutrient availability in soils from areas recovering from windthrows may favor forest regrowth and increase vegetation resilience. We continuously measured CH4 and N2O fluxes on two pastures that differed with respect to management. Two micrometeorological ratio methods were used; one was more suitable for daytime and the other for night-time. Over a year, both methods indicated both sites as net sources of CH4 and N2O, similar to other managed grasslands. At the irrigated, fertilised and rotationally grazed site, the N2O emissions were 1.21 (±0.15) % of the nitrogen inputs from animal excreta and fertiliser application. We use atmospheric data from the US and Canada to examine seven wetland methane flux estimates. Relative to existing estimates, we find a methane source that is smaller in magnitude with a broader seasonal cycle. Furthermore, we estimate the largest fluxes over the Hudson Bay Lowlands, a spatial distribution that differs from commonly used remote sensing estimates of wetland location. Nitrogen isotope ratios (δ15N) of NH4+ in dairy manure compost piles were studied. The δ15N–NH4+ values in different pile zones (top, side and core) show that extremely high nitrogen conversion, nitrification–denitrification activity of the microbes and NH3 volatilization occurred in pile top zone, which has very high NH4+ concentrations and significantly high 15N (δ15N: 12.7–29.8 ‰) values.